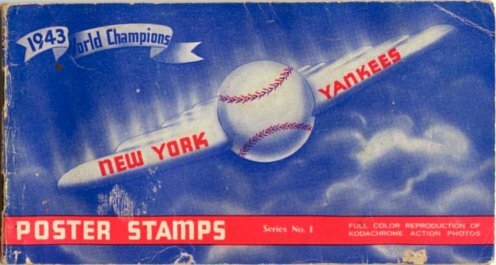 One of the very few series produced during World War II, this set was issued in 1944 commemorating the 1943 World Series champion New York Yankees. The set is further important because it contains cards of players that do not appear in any other card set of the period. The 30 stamps in the set were all printed on a single perforated sheet (see example sheet at bottom of this web page). 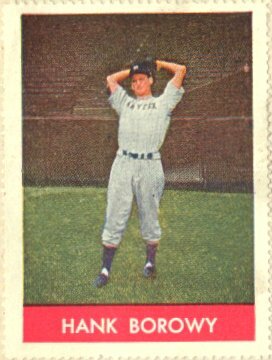 All players are shown in full-length "action" poses taken inside an empty Yankee stadium by photographer George Dorrill. 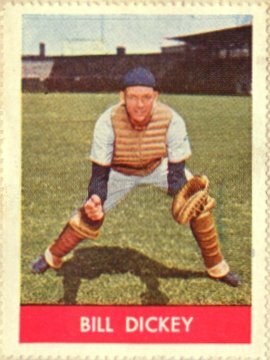 The uniformed players in the photographs are positioned generally against a green turf with a red title block at the bottom of the stamp. 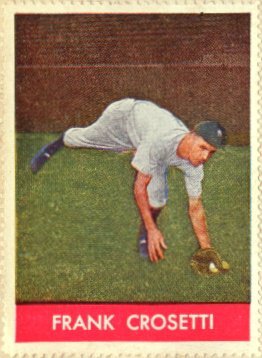 The player's name is printed in all capital lettering within the title block. 6-1/2-inch horizontal format, was also available to hold the stamps. As seen in the example pages from the album here, each player stamp was placed on a separate page that also contained player statistics and team affiliations from previous years. The album also honors the Yankee champions who subsequently participated in the armed forces (see inside front cover). 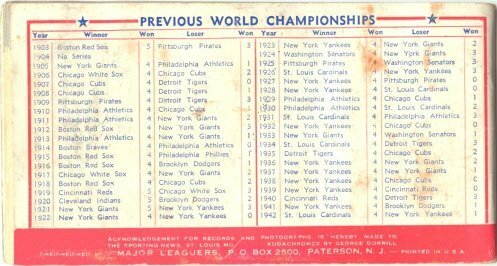 In addition, scoring for each game in the 1943 World Series is detailed, and a table is provided on the back cover listing all World Series champion teams going back to the first series played in 1903. 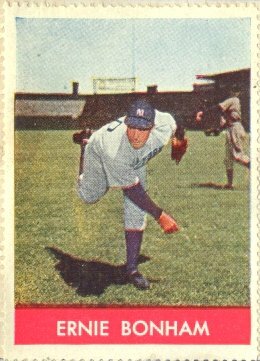 A full sheet of the 1943 Yankee stamps is shown at right. As seen, the sheet contains five rows of six cards each, along with labeling and a sheet title at the bottom.